Two U.S. Air Force F-22 Raptor stealth jet fighters fly near Andersen Air Force Base in this handout photo dated Aug. 4, 2010. Data supplied by the cybersecurity firm Secureworks shows Fancy Bear’s hacking targets included defense contractor employees at Lockheed Martin, General Atomics, and Boeing, involved in the development of these systems. The AP has previously reported on Fancy Bear's attempts to break into the Gmail accounts of Hillary Clinton's presidential campaign, American national security officials, journalists, and Kremlin critics and adversaries around the world. U.S. intelligence agencies have concluded the hackers worked for the Kremlin and stole U.S. campaign emails to tilt the 2016 election toward Donald Trump. But the hackers clearly had broader aims. 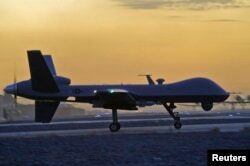 Fifteen of the targets identified by the AP worked on drones — the single-largest group of weapons specialists. "This bird is quite unique," said Buet. "It can fly at 62,000 feet [18,600 meters] and doesn't land for five years." 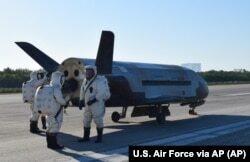 FILE - This image provided by the U.S. Air Force shows the Air Force's X-37B spacecraft at NASA's Kennedy Space Center Shuttle Landing Facility in Cape Canaveral, Florida, May 7, 2017. Some officials were particularly upset by the failure to notify employees of cloud computing companies that handle data for intelligence agencies. The cloud is a "huge target for foreign intelligence services in general —they love to get into that shared environment," said Sowell, the former adviser to the Office of the Director of National Intelligence.